We are proud to present RedSeal, a micro-niche theme crafted with notary public services in mind. We gave our best to cover all aspects of the notary practices: standard routines, the most useful services and practical day-to-day tasks. 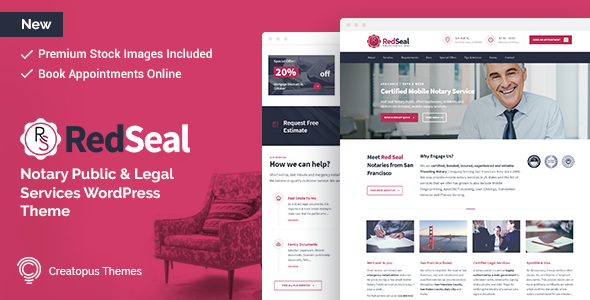 However, while covering the specific aspects of the notary vocation, RedSeal theme can be easily customized for various different proffessional fields: law offices, accounting firms, consulting businesses… Handcrafted with ♥ by CreatopusThemes! RedSeal has been tested with browsers IE10, IE11, Firefox, Safari, Opera, Chrome, Edge.